2018 Cornhusker State Games – OPEN Events – Let's Cause a Racquet! TIMES: Pre-Tournament instructions at 8:15 a.m. Competition starts at 8:30 a.m.
SITE: University of Nebraska Medical Center, Student Life Building/Center. NOTE: There will be NO ADMISSION OR GATE CHARGE for spectators at this event. Some events may have to be played on Sunday, depending on the number of entries. All players will be notified if a change is made. Open: Has played indoor competitive badminton in local or regional tournaments and plays at least once a week on a regular basis. Recreational: Plays indoor badminton at a club or gym once in a while or plays for fun and exercise with little or no experience. Senior: Must be 50 years of age or older as of July 19, 2017. High School: Must be between 15-18 years of age as of July 19, 2017. Youth: Must be 14 years of age or younger as of July 19, 2017. Disabled: Uses a wheelchair or other mobility aid. Family Recreational: Parent (recreational player) with youth 14 or under. Wheelchair 1 (WH 1) Require wheelchair. Impairment in both lower limbs and trunk function. Wheelchair 2 (WH 2) Require wheelchair. Could have impairment in one or both lower limbs or no impairment of the trunk. Standing Lower (SL 3) Must play standing. Could have impairment in one or both lower limbs and poor walking/running balance. Standing Lower (SL 4) Second standing class. Player has lesser impairment compared to SL 3. Standing Upper (SU 5) Has impairment of upper limbs. Short Stature (SS 6) Dwarfs. COMPETITION FORMAT: Championship/consolation. Director may split divisions and reserves the right to combine events based on the number of entries. All participants will be guaranteed at least two matches. First match determines placement. Loser of first round match drops to single-elimination consolation bracket and winner advances in the single-elimination championship bracket. Semi-final losers, in the winners bracket, play for third place (bronze medal). The tournament will be conducted using rally scoring: all events are best of three games to 21 points. Must win by two points unless game is tied at 29 all. Then, next point wins. EQUIPMENT: Approved synthetic shuttlecocks will be supplied. Feather shuttlecocks may be used providing specific match competitors mutually agree before the start of a match. Feather shuttles must be supplied by the participants. Players must also supply their own rackets. AWARDS: Custom Cornhusker State Games gold, silver and bronze medals will be awarded to the top three players/teams in each division. Fourth place player/team will receive a certificate. 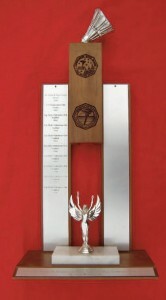 A traveling trophy will be awarded to the school/organization or group that brings the most entrants. RULES: USA Badminton rules will apply. FOR FURTHER INFORMATION: Badminton Director Bob Ericson at 402-571-6933 or shuttle@inebraska.com. Contact Bob for information concerning Badminton rules or equipment.